My first visit to Strata was many years ago, on a random and rainy Saturday afternoon in Glasgow. Quite frankly, I hated it. Overpriced, poor quality pub food that you’d expect to find out of a box from a supermarket. At the time, I thought I’d never go back again. 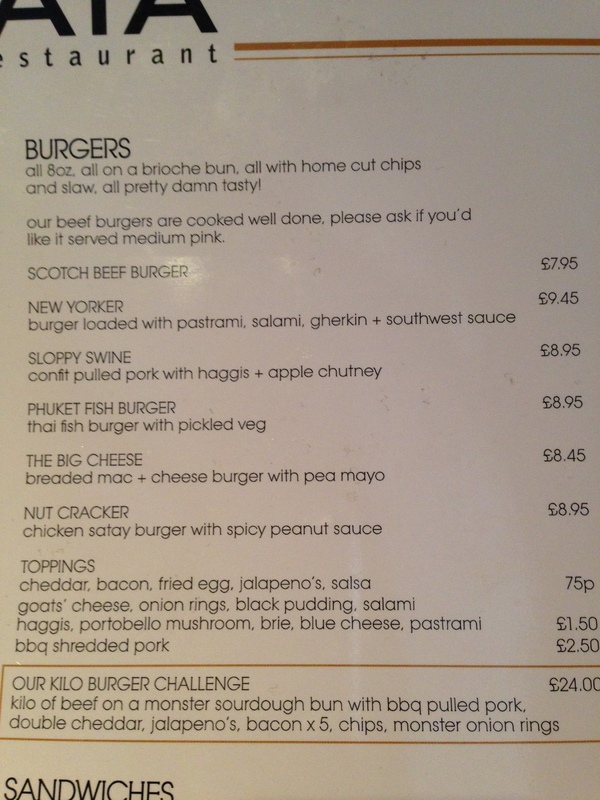 Recently; however, at Glasgow’s 2013 ‘burger-off’, Strata had entered one of their burgers into the competition. Despite my reservations based on my previous pre-JVB experience, I thought that it was one of the best burgers entered into the competition. At the time, I was sure that there was no way such a delicious burger could have came from the same place that I had such a bad experience in a few years earlier. I later heard rumblings that in the past couple of years, Strata had gone through several menu and management changes. With that in mind and based on the burger I sampled at the competition, I decided that it was time to go back – this time, for a burger. We opted for the New Yorker burger & the Sloppy Swine. As we ordered, we were informed that the burgers would be served slightly pink throughout. We were asked if that was okay and if not, we could request them well done. I decided to go the opposite way and ask for it to be cooked medium. Presentation-wise, the New Yorker looked pretty decent. Everything was housed nicely inside the bun and there were no signs of anything spilling out over the sides. The bun appeared nicely toasted and the whole thing was presented on a heavy wooden board with a mini basket of fries on the side. 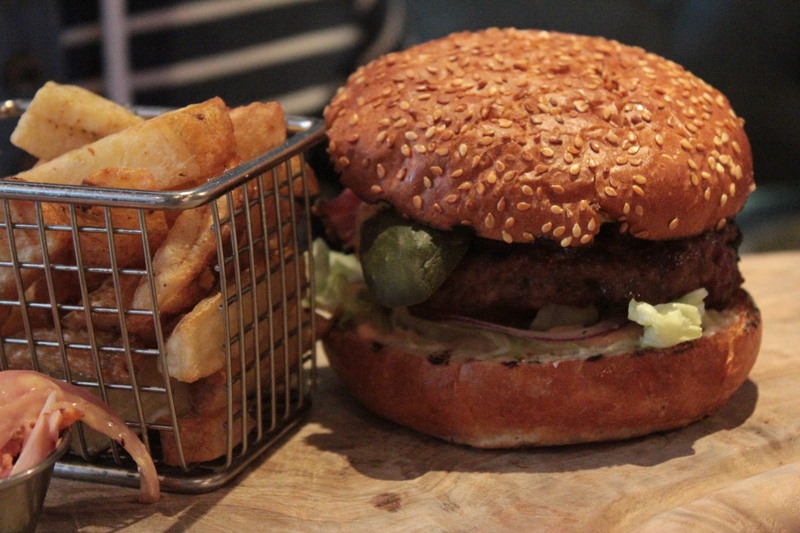 Taste-wise, this burger definitely delivered. The patty was cooked to absolute perfection and served medium throughout, as requested. It was well-seasoned and had a nice, fully rounded flavour. It was clear that the quality of the meat that’s been sourced for these burgers is pretty high. 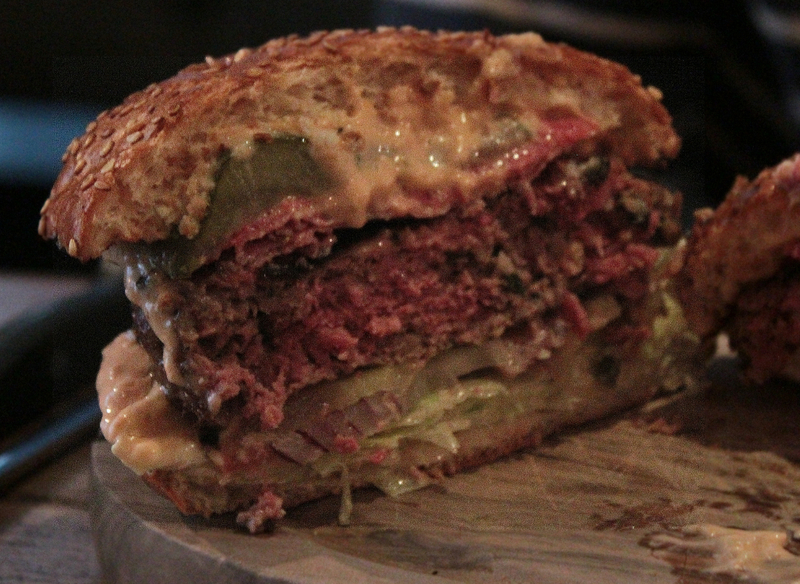 The sharp, peppery flavour of the pastrami, the slight hint of saltiness from the salami and the gherkins worked very well together and complimented the patty very well. 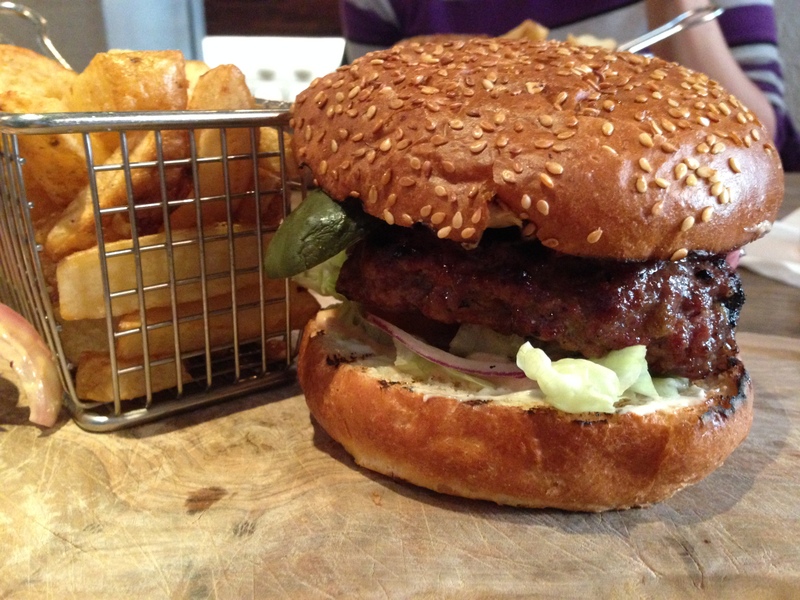 Despite several other strong flavours being present on the burger, the beef held its own and wasn’t lost in the mix. The southwest sauce was absolutely delicious and overall, the burger had a gourmet fast food quality to it, which was very good. The only thing missing from this one was cheese, but I probably should have added that when placing my order. Oops! As mentioned, the bun housed everything well and was nicely toasted. This was an outstanding burger. The Sloppy Swine was presented in the same way as the New Yorker – on a wooden serving board with fries. The Sloppy Swine; despite being on the burger menu, is actually more of a sandwich housed in the same toasted bun as the New Yorker. It consisted of haggis, barbecue pulled pork and apple chutney. Admittedly, like many others, we’re getting a little tired of pulled pork appearing on every single menu, purely because it’s on just about every single one in Glasgow now. When it’s done right; however, it’s still always going to be absolutely delicious. Thankfully, the pulled pork on this sandwich was very tasty and contained just enough barbecue to add flavour without drowning out the pork itself. I’ve never had pulled pork with haggis before, but it worked very well, especially with the chutney and provided a nice sweet & slightly spicy combination. Unfortunately, the bun that housed the New Yorker so well just didn’t work here. Just under halfway through the sandwich, the bottom half completely fell apart which left us eating the rest with a fork. As mentioned, the buns weren’t bad, but the barbecue sauce-laden pork along with the relish was just too much for the bread to handle. Plus, I’m not really sure why it’s on the burger menu either. I’m glad that we decided to check out Strata after a disappointing visit many years ago. 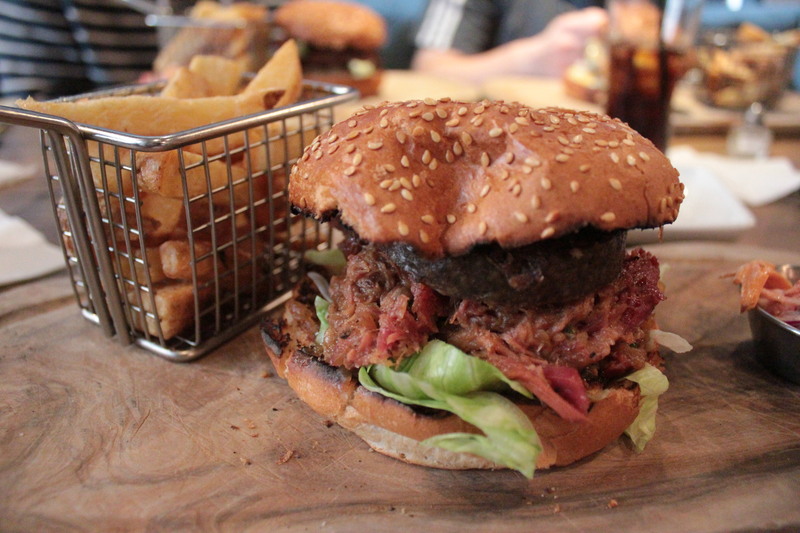 It’s pretty clear that their focus is on high quality meat and well-cooked burgers rather than just bog-standard pub grub, which is always a welcome addition to Glasgow. 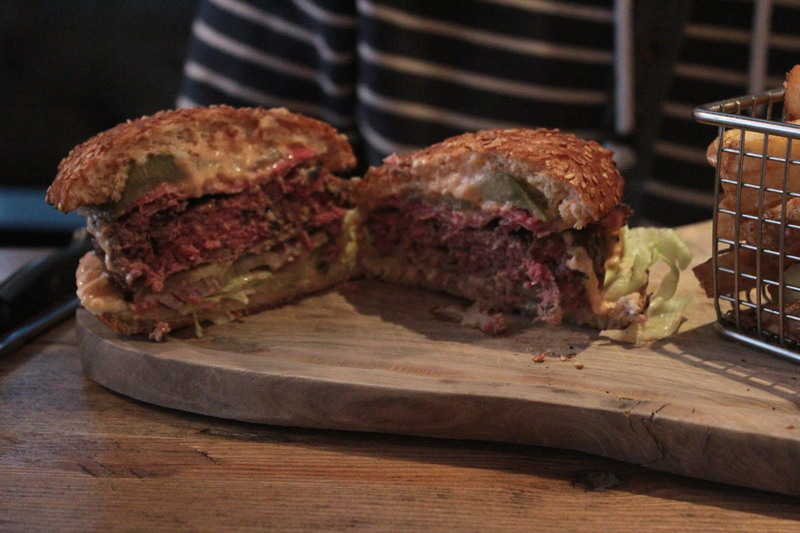 One of the most well-cooked patties in Glasgow means that you should definitely check it out. Just remember to ask for it to be served the way you want it. 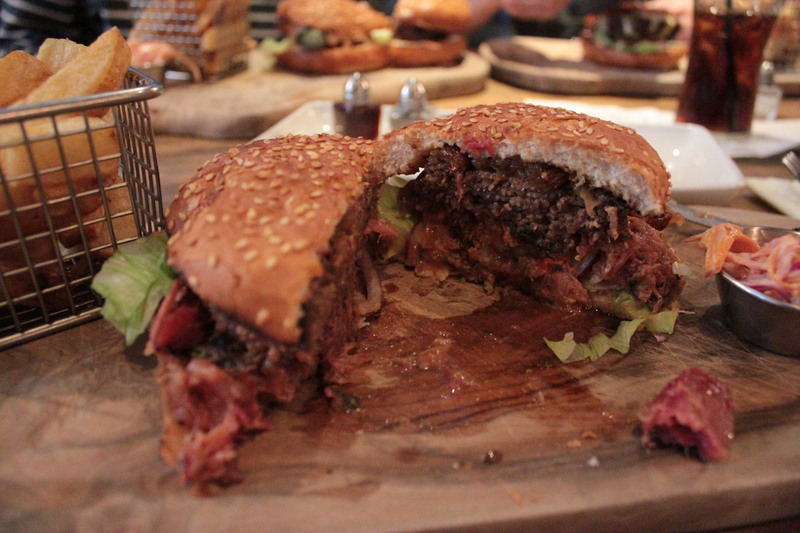 + One of the most well-cooked burgers we’ve had in Glasgow. + Southwest sauce was excellent. – The bun tasted good, but the bottom fell apart towards the end of the ‘Sloppy Swine’ sandwich.